Nicaragua is a beautiful, diverse country with rich culture and history. 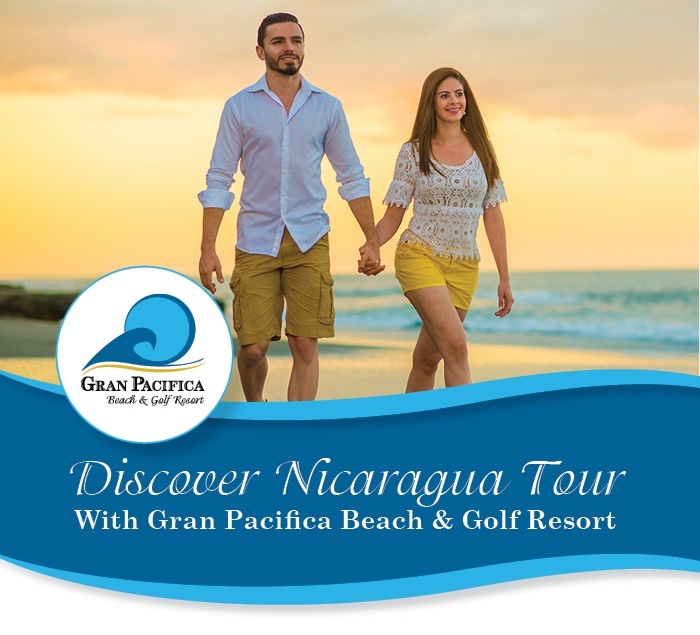 Gran Pacifica Beach and Golf Resort invites you to Discover Nicaragua on the vacation of a lifetime! Gran Pacifica offers luxurious accommodations and first-class amenities, including golf, spa treatments, horseback riding on the beach, and one of the best surf breaks in Central America. All of this is at your fingertips, and your first day in the country has just begun! 2 nights and 3 days at Gran Pacifica Beach and Golf Resort. All meals and national drinks included at our award winning SeaSalt Restaurante overlooking the infinity pool and Pacific Ocean. Tour to the Volcano Masaya. Stand at the edge of an active volcano, looking down into its depths! Then head off to a Boat tour of Lake Nicaragua, including Monkey Island! And end with an amazing city tour of Granada. Granada is the oldest city in the America’s, founded in 1524 and built in the beautiful Spanish Colonial style. Tour of Gran Pacifica Beach and Golf Resort. Airport transportation to and from the Gran Pacifica Resort. Experience all this and so much more of the beauty that makes Nicaragua a unique destination, drawing millions of visitors each year!